This is a progressive disease that destroys memory and other mental functions. In this disease, the connections between the brain cells and the brain cells themselves degenerate and die, causing a steady decline in memory and mental function. • At first, increasing forgetfulness or mild confusion may be the only symptoms one notices. 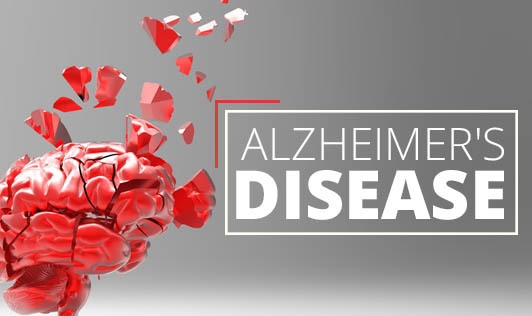 • The memory loss associated with Alzheimer's disease persists and worsens affecting one's ability to function at work and home. • People with Alzheimer's disease may repeat statements or questions over and over without realising that they've asked the question before. • Eventually forget the names of family members and everyday objects. • Experience disorientation and misinterpreting spatial relationships. • They may have trouble finding the right words to identify objects, express thoughts or converse with someone. The ability to read and write also declines. • Difficulty concentrating and thinking especially about abstract concepts like numbers. • Responding to everyday challenges becomes increasingly challenging. • Changes in personality and behaviour such as depression, social withdrawal, distrust in others, aggressiveness, loss of inhibitions and delusions such as believing that something has been stolen. Scientists believe that this disease results from a combination of genetic, lifestyle and environmental factors that affect the brain over time. • Women may be more likely than men to develop this disease, in part because they live longer.